01/09 – Newtype #02 – Drop. 20. 02/10 – Newtype #03 – Drop. 21. 03/10 – Newtype #04 – ? The information whether Kobato. will be published in the April issue of Newtype is missing in CLAMP-NET.COM (hence the “?”). I will update the post later when they fix it. 01/18 – Young Magazine #07 – Chapter 196. 01/25 – Young Magazine #08 – No XXXHOLiC scheduled. 02/01 – Young Magazine #09 – Chapter 197. 02/08 – Young Magazine #10 – Chapter 198. It’s so pretty~ I bet next box will be about Autumn and Winter? Good observation about Kohane, we really haven’t seen Himawari appear in “Rou” yet, have we? The box is preeeety(but i have refrained from watching Kobato until the last episode airs).I wasn’t shocked about Watanuki wearing Yuko’s kimono in the first episode of Kei he wore an Alice in Woderland outfit!I’d prefer Doumeki’s suit to be darker(don’t look at me like that Clamp males should always wear black suits! )and Kohane seems a little too old but i’l wait and see! >I wasn’t shocked about Watanuki wearing Yuko’s kimono in the first episode of Kei he wore an Alice in Woderland outfit! thanks for the news! !and happy new year!! i want the pic of the header!!!!!! and i want to know what lady spider wants, apart for sexing our Kimihiro! It’s official: Watanuki has become a drag queen. He’s showing a lot of chest in the red kimono (boobieless Watanuki can’t fill it) and legs :S (I hope his leg isn’t hairy xD). Also the purple yukata looks very, very girly (specially that pastel purple). He has also wore a girl japanese clothing in the manga (http://www.mangafox.com/manga/xxxholic/v16/c192/4.html) i think it was a furisode, with a ribbon. And that didn’t look like Yuuko’s previous clothing. Makes me wonder what kind of crossdressing, girly, fanservice clothes Yuuko left for him…. I prefer the one he wore in the latest chapter, I loved that scarf he wore. Spider lady loved it too. Am I the only one who doesn’t like those round glasses? I prefer the oval ones. Did I miss why they become round? No reason? Production IG just decided to do it round this time? It could be Production IG trying to make a joke by referencing how the fans think Watanuki looks like Clow Read. They’ve certainly made strange CCS references before, what with Sakura’s cameo appearance in the “Tokyo Revelations” OAD. lol I re-watched that today. My dear Kimihiro-kun…you just don’t fill out that kimono like Yuuko does! I like Doumeki’s ‘lounging about Watanuki’s shop’ outfit! And Kohane-chan looks sooooooo pretty! Oh, I want that Kobato. box! I may just buy the DVDs, since the anime makes me feel warm and fuzzy. But it’s a shame most of the bonus goodies you have to send for or buy from a specific place. Anyway, I hope Kobato. doesn’t have a break in April. They’ve been pretty consistent since the anime was announced and it’s already too few and far inbetween! And it’s nice to see HOLiC a little more stable. Doumeki reminds me of Binkan 😀 the salaryman! It really is. CLAMP are so good with their boxes. Kobato. DVD illustrations are so pretty! Thanks for the heads up on OAD info. Do you have/know where I can find a larger version of that picture of Kobato and the morning glories in your icon? It’s so pretty! Those are beautiful Kobato illustrations. I love the hydrangeas in the “Summer” cover. Isn’t there any confirmations on which will be the OP & ED yet? I mean, if it’ll still be “sofa” and “CHERISH” or if there’s something new. 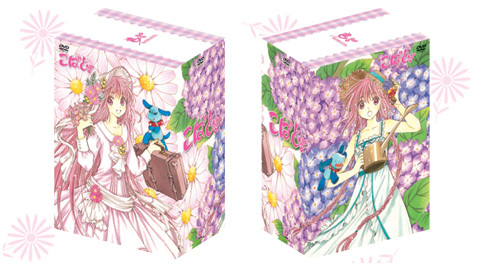 Beautiful work as always with CLAMP’s illustrations for the Kobato DVD box! I wish I could say the same for Watanuki’s pale, scrawny legs sticking out of Yuuko’s kimono. Hey! I made a pic comparing sizes of Watanuki, Doumeki and Kohane =D I used the head of each char to make sure the characters were “sized equally”. Doumeki is freaking huge and Kohane is as lovely as ever! OMG! yuuko will be angry with watanuki when she come back, but really watanuki should not use her clothes, he looks so little with those and girly then again she looked great but he DOES NOT. maybe she’d be overjoyed since she loved to crossdress him. Hm, I’m glad watanuki hasn’t found that lacy little top-thing of yuuko’s : D That would have made it even draggier. u mean the purple bra thing? or the necklace? Oh, I love the box set, but it’s so much cheaper and easier to wait for DVDs to come out in North America, especially since I can take all subs off and watch the Japanese dub pure. Doumeki’s just too formal here.